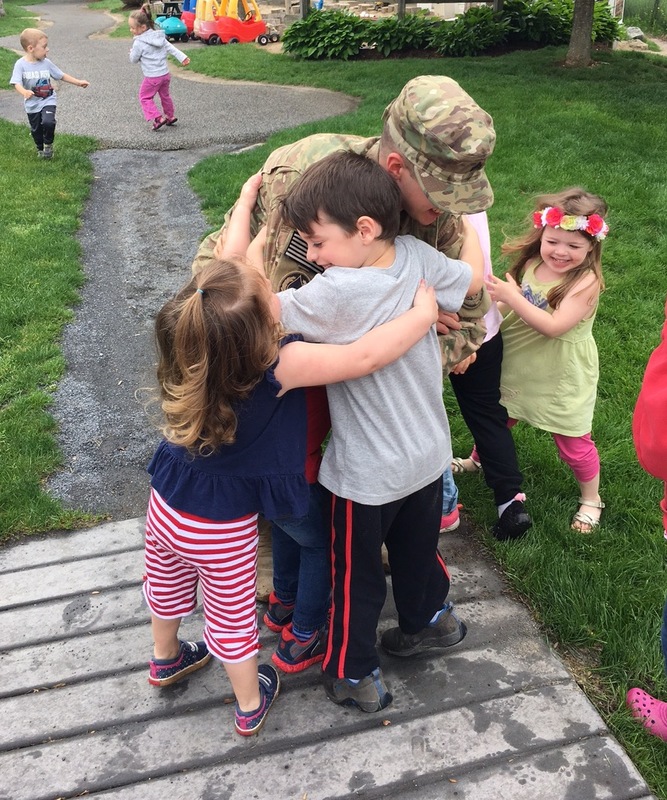 Our pen-pal returned home from Afghanistan! It was quite a reunion. 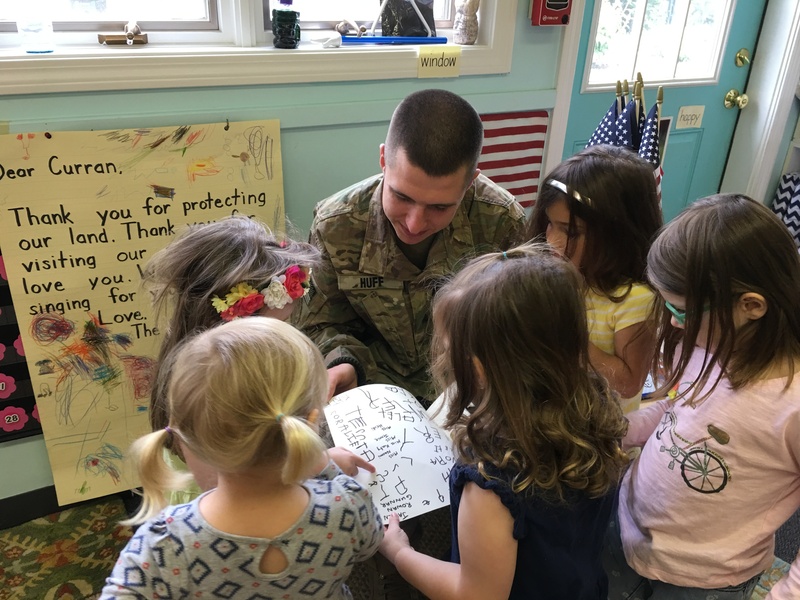 After many months of corresponding with each other- sending giant letters, pictures, drawings, and care packages- Sergeant Curran walked into my classroom to meet the children. They were so quiet at first. Perhaps it was the uniform. Or maybe it was simply the moment; a dream that became a reality. I was choked up. A big hug broke the ice and Sergeant Curran joined the group of children to shake hands and give hugs. We asked him so many questions! Then, we presented him with a copy of his favorite childhood book, Mr. Gumpy’s Outing, signed by all the children. We then asked him to read the book aloud. There’s nothing quite like singing a patriotic song, especially to a member of our military in uniform. We sang “Red, White, and Blue” and “God Bless America” to Sergeant Curran. Now the tables were turned, and he was the quiet one. Watching young children stand with their hands on their heart, belting out a favorite patriotic song, was a ‘moment’ for our pen-pal. We had six American flags to plant in our school’s Memory Garden. They were from the Memorial Day Remembrance, held indoors due to the rain. 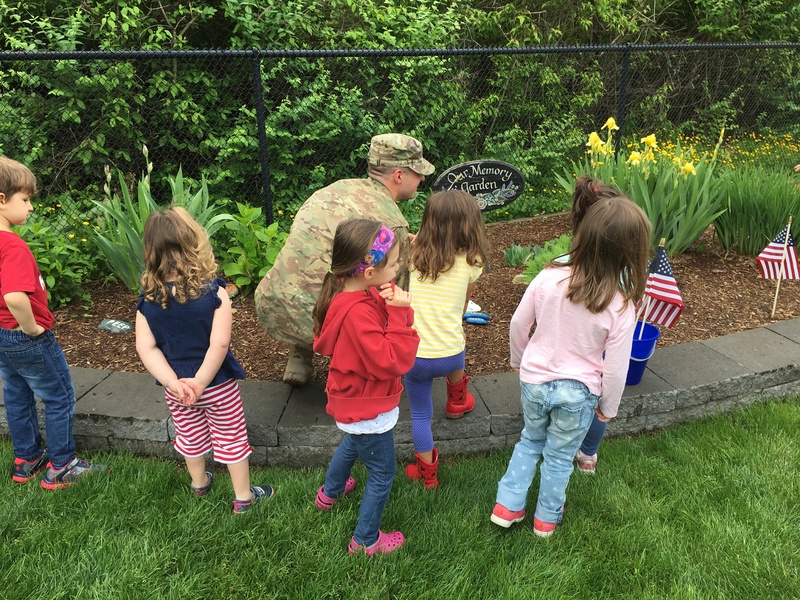 It was fitting that Sergeant Curran would have the honor of planting the flags, alongside the children. It is interesting that children understand the significance of our Memory Garden. While it is part of the playground, it holds painted rocks among beautiful flowers, marking classroom pets that have died. It holds stepping stones and a statue to remember children who have died. American flags fly there to honor our military and remember those who have served. I don’t take children to the Memory Garden as a lesson; I simply talk and answer questions when children are there, whether it is in curiosity of the painted rocks, or in the quiet solitude of just being there. Children know. They feel, and want to learn and understand. I need to be there when that happens. The circle of life. And, our pen-pal gave new life to the Memory Garden. 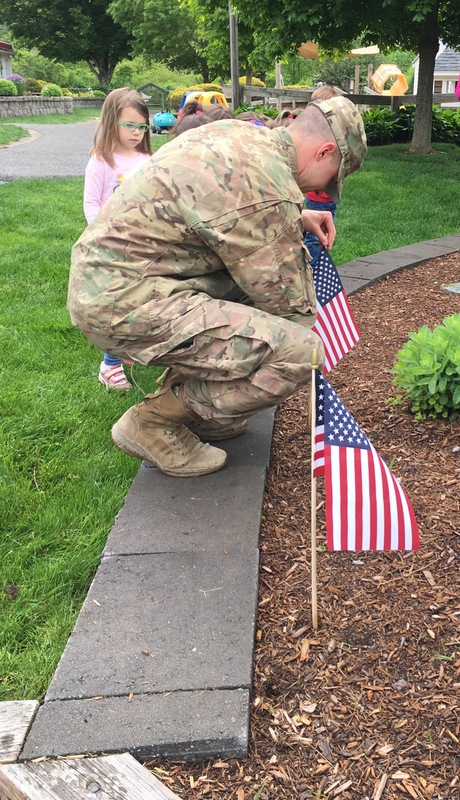 The American flags were planted with great respect. It was a wonderful day! 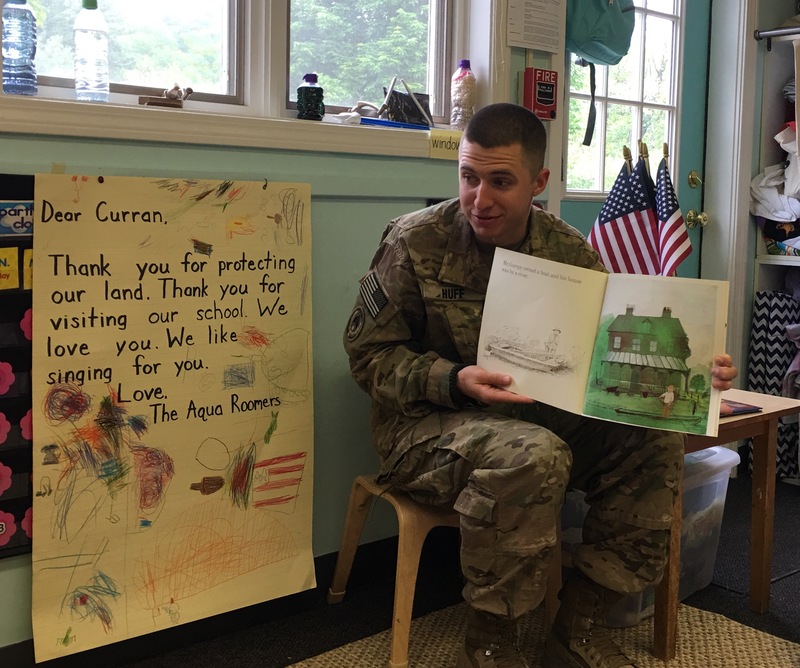 Thank you Sergeant Curran for all you do, and for being our pen-pal. The children will forever remember you. This entry was posted in Early Education, military, patriotism, Teaching young children and tagged "God Bless America", "Red White and Blue", American flag, Early Education, Memory Garden, military, patriotism, Pen-Pal, reading books to children, thanking our military. Bookmark the permalink. How very special!! The kids won´t forget this. Thank you, Darlene. I think you are right- they won’t forget. I’m sure that the kids will remember that day. I think they will, John. Thanks! Oh, what a lovely post. So nice for your children to have had this experience, Jennie. I love that you shared this. Thank you. Your students and you blessed him as much as he blessed you. What a wonderful lesson and memory for these kids to carry forward. Something for both children and soldier to treasure for all their lives. Wonderful stuff indeed, Jennie, and a valuable life lesson too. Wonderful post. You remind me of some of my great teachers, when I was growing up.You are teaching your students some very valuable lessons, such as respect, patriotism, and caring for others. Ill bet, even Sergeant Curran learned some things. Keep up the good work. Wow! This is a wonderful post, Jennie! How wonderful that your Sergeant Curran is a kind and loving person. Truly memorable. Thanks for this. “Mr. Grumpy’s Outing” now if that isn’t a ‘tell’…HA! Seems this young man has grown into a fine one…Thank him from me, too. No, no… Mr. Gumpy, not Grumpy. Ha! So glad you enjoyed the post, Laura. Thank you! oh, my apologies to the Sergeant!!!! I thought it was so funny! 😀 No apologies necessary, Laura. Such a wonderful story, Jennie. I wonder when children start to grasp the understanding of duty and honor. Sgt. Curran surely does. Thank you, Steve. I think grasping the concept is cumulative, and happens after multiple events. Kids will get it over time, with exposure. Aw, what a special event. It’s wonderful how they could meet him in a safe comfortable environment, get to know him as a friend, rather than as a big soldier marching down the street at a distance away. I’m rushing, but hopefully my words are clear. I’m happy the day went well. I know exactly what you mean, Marcia. The ‘up close and personal’ makes such a difference. All the difference in the world, actually. It was wonderful! Thank you, Diana. He was terrific, and the children loved him. This is simply a wonderful post! So wonderfully different than my memories of being the daughter of a deployed soldier during Vietnam… children weeping in class missing their dads, dads gone MIA, the sense that adults did not approve of you because of your father’s job…. THIS, this is what it should have been even then… And the little military brat in me says thank you. 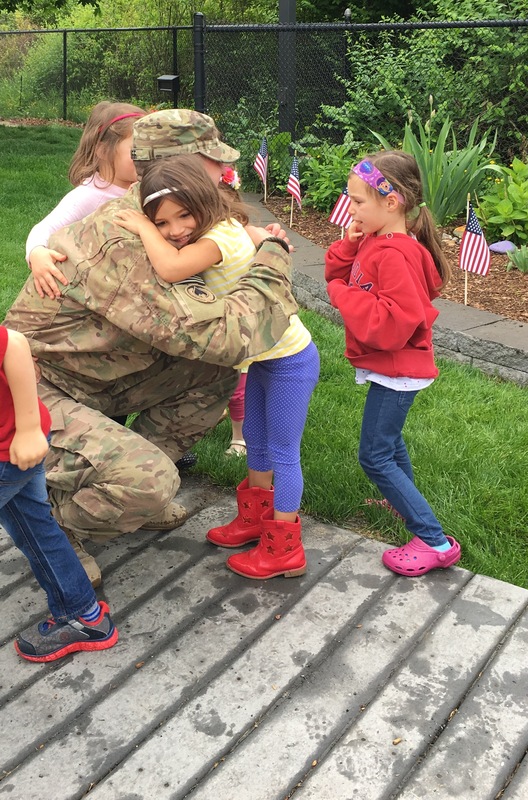 Thank you for making soldiers something besides soldiers — for making them FAMILY. Your story rings true. My husband was not permitted to wear his uniform in the Vietnam era in public because of disapproval and even potential harm. How sad! And to think that your teachers didn’t embrace patriotism and welcome soldiers into the classroom. They were NOT thinking of the children at all. Do teachers today welcome soldiers? Not many. I am so glad I can do a tiny bit to give children a sense of pride and giving thanks to our military. Yes, they become family!! That is a wonderful thing. What an awesome story! And you’re right, children do understand spaces like the memory garden you mentioned. In fact they probably understand a lot more than we adults realize. Thank you, Josh. And yes, children do understand more than we realize. So glad you enjoyed the story! As the mom of an Army Sergeant, I loved this post. I’m so glad you liked it, Jacqui. Thank you! So touching. I wish all our soldiers could experience this. What a great way to help kids to understand patriotism and honor. This means so much to the children and to your pen pal, words are not enough to say how very transforming and meaningful it can be for both. K. D.
Thank you so much, Karen. I so appreciate your words! This means so much to children and to your pen pal, words are not enough to say how very transforming and meaningful it can be for both. Thank you, Jennie for sharing this endearing and very special occasion. Jennie, I reblogged this touching and meaningful occasion for the children and your Pen Pal, and now for all of us. Everything about this post made me happy and a bit wistful. I liked what KC Redding-Gonzalez had to say about it as well. This is important learning and experiencing for children. Thank you for being that kind of teacher. Jennie, your class is very special and lucky to have you as a teacher and leader. They learn so much about mature things which are important to feel safe and loved while learning. Both Sgt Curran and your class in the aqua colored room were blessed! I always did the pledge of allegiance every day no matter preschool special needs or middle school. When I was an activity director at a nursing home we matched interests between the elderly and sixth graders for history lessons. We invited them to attend Veteran’s Day services. They arrived in a bus three times annually. Where we had the HS color guard, the local VFW and the ROTC help bring each wheelchair with a Vet forward to be acknowledged. I love this, Robin. You paint the best pictures with your stories, from Maxine to recalling 3×5 size photos. Preschool does hold great memories. Many thanks! Many thanks! So glad you enjoyed the story. I don’t just like this post-Jennie, I love it. I am sitting her trying to post with tears streaming down my face and a tissue to wipe them away, but, it’s not working. This is a beautiful, loving post and a tribute to our hero’s. I am reblogging this and hope that many more people will do the same. Thank you so much, Patricia!! Your reply leaves me with a lump in my throat and a full heart. ❤️ Much appreciation for reblogging, too. It was a fitting finale for a fine soldier and a hero. 🙂 Best to you! A most well deserved and beautiful tribute to one of America’s Heros. What a magnificent learning experience yu provided to these children. Congratulations!